Have you ever come across a beauty product that literally smells good enough to eat? I've experienced this to some extent with Soap and Glory bath products and various fruity shower gels in the past, but let me tell you- this is something else! Nspa products are well known for smelling absolutely gorgeous, but they've really nailed it with these- oh.my.god they smell delicious. 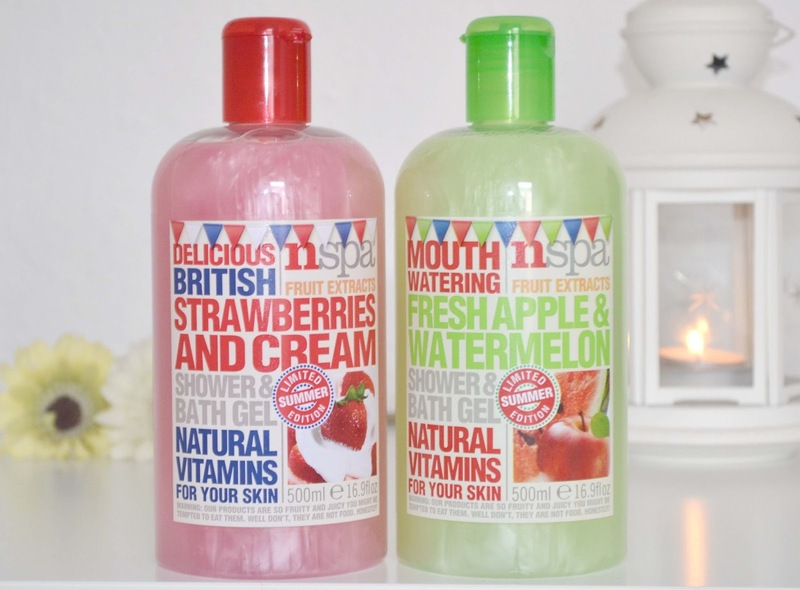 These two fruity scents are two of Nspa's newest releases, and believe me you really don't want to miss out on these beauties. I'm already a huge fan on Nspa's shower gels, rewind a couple of months and I mentioned how their Passionfruit and Raspberry scents were two staples in my bathroom and for good reason too. You know sometimes how you smell a shower gel in the shop, get home and jump in the bath all excited and it ends up being a watery mess that doesn't even foam up? Well that's definitely not the case with these. Not only do they smell great but actually perform properly too- a nice lather, not too thin and not watery. If you've ever tried Chupa Chups strawberries and cream lollies (and if you haven't...you were spending your pocket money on the wrong things as a kid) the Strawberries and Cream scent smells just like those. Creamy, sweet and fruity it's amazing. Fresh Apple and Watermelon doesn't sound quite as exciting (and I didn't think I'd like it half as much as the strawberry one) but I think I like it even more. Its fresh and has a sweet sourness to it a lot like fruity sweets. The only problem is they smell so nice I find myself using way more than needed just to savour the scent! They're limited edition for the summer which is a bit annoying, but I'll definitely be stocking up on them while they're still available. Hopefully they add them to the permanent line eventually (and bring out some more similar scents too!) I can't see these two varieties on the website at the moment, but you'll be able to find them in your local Asda/ Asda direct. 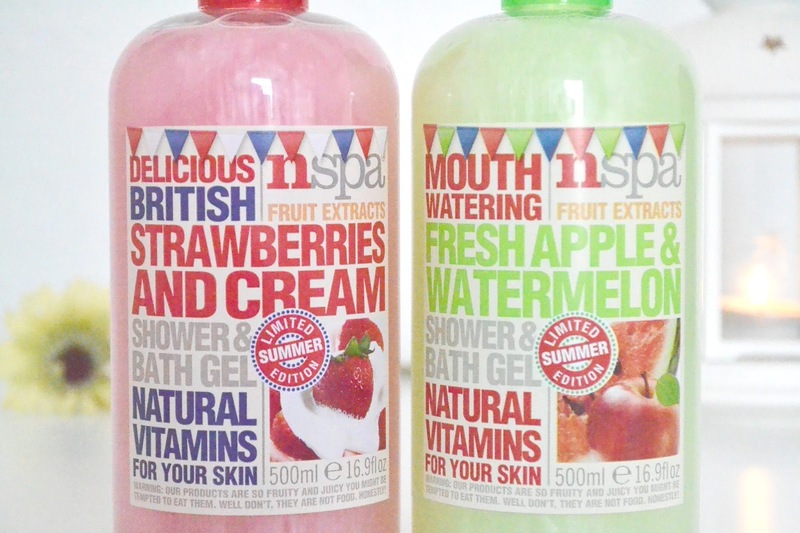 What's your favourite Nspa shower gel? These sound so amazing. Strawberry and cream sounds really sweet, whilst the other sounds very fruity and fresh. I love your blog design btw. Definitely the Vanilla one but these look lovely too! I'm tempted by the Strawberries & Cream one, it seems like a scent that will make you feel all luxurious and pampered. They sound soo good! I'll definitely be keeping a look out for those. I've never tried that brand before but it sounds amazing! I have never heard of this brand before, but I always like a beauty product that has a yummy scent too! thanks for sharing. But anyway, the Strawberries and Cream scent sounds amazing! I'm really into anything with the word "cream" in it these days. Mmm.